Learn how to manage the admin controls of the peer selection process. As an admin, you also can override or add additional peer reviewers for anyone. Once you create the review cycle, you will be redirected to the Peer Selection launch page. The first step will be to send a launch email. 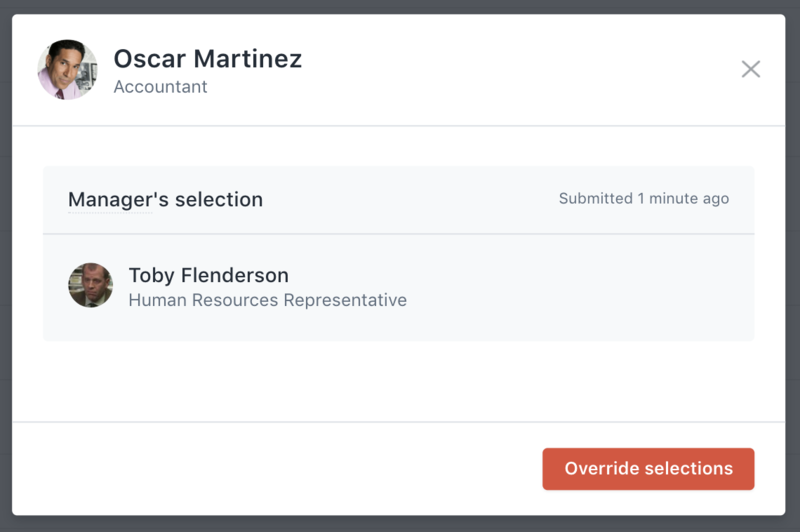 If you opted for managers to select the peers for their direct reports → Managers will be notified to begin their selections. If you opted for reviewees to nominate their own peers → Everyone in the cycle will be notified to begin their nominations. The peer selection process can take some time. Therefore, we've given admins the ability to override all peer selections made by employees. An admin can do this by clicking the 3 dots (...) next to a reviewee's name > View Peer Reviewers > Override selections. This allows the admin to add or remove peers for any user. Once the admin has completed the override, the employee will no longer have the ability to select peers. It's very likely that some of your cross-functional employees may receive a lot of peer nomination requests. 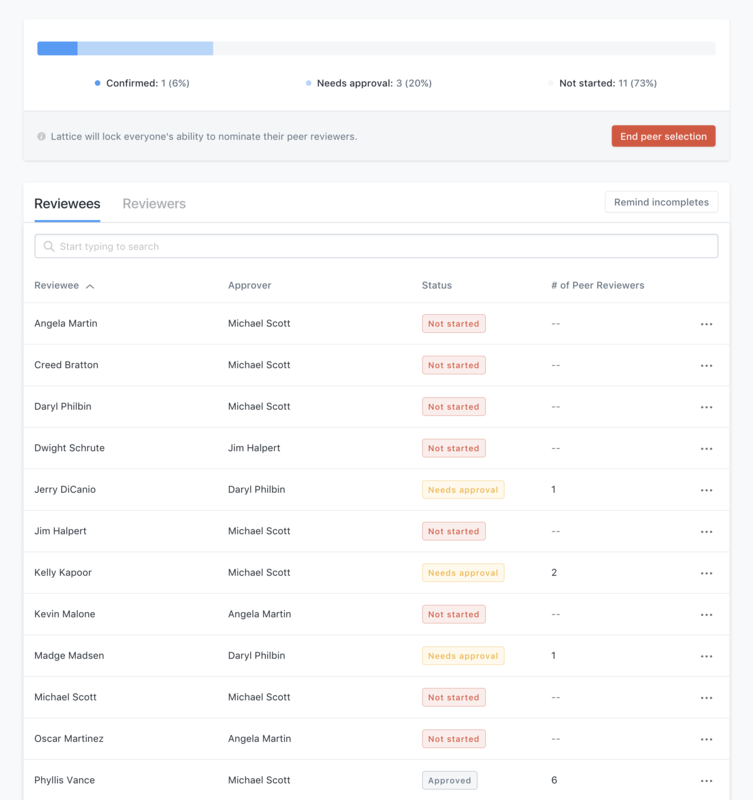 While it may make sense for that employee to fill out all of those peer reviews, we want to give admins the visibility and option to remove some of the peer nomination requests before ending peer selection. To view the number of times an employee has been nominated, click Reviewers and you will see a list of all peer reviewers nominated and the # of peers they have to review. You can click the # of peers to review header and we will sort the list for you in descending order. We also show you which employees nominated that peer so you can decide which peer nominations make (or don't make) sense. 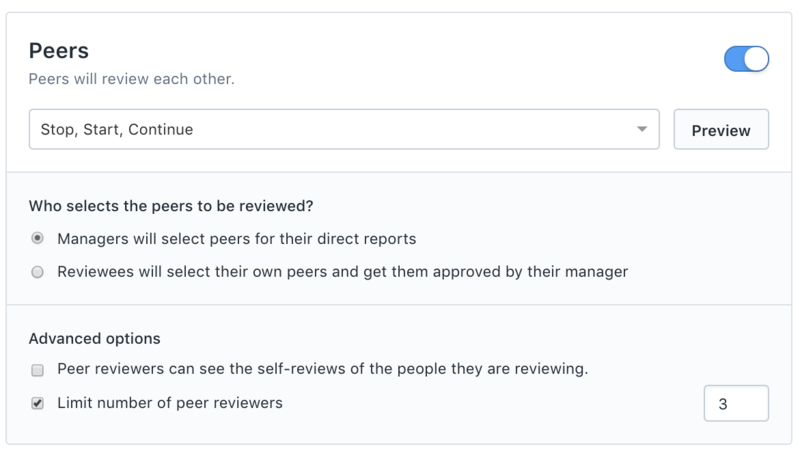 If you decide to decrease the # of peer reviews someone has to complete, you can go back to the Reviewees tab and override an employee's peer selections. For example, in the image below, you may decide that Toby should not review Oscar. 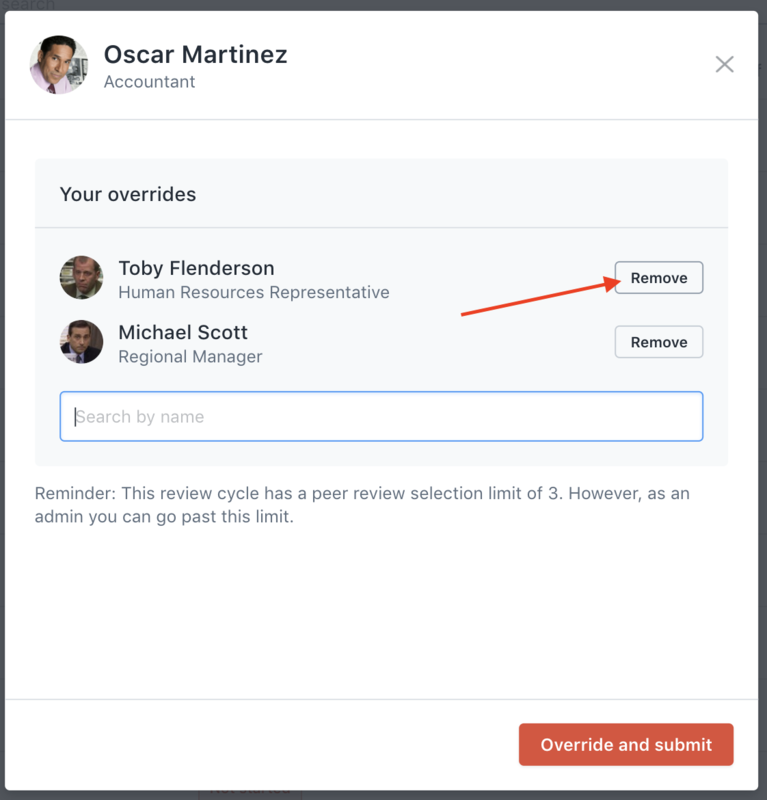 You can then go to the Reviewee's tab and override Oscar's peer nominations by removing Toby as one of his peer reviewers. As an admin, you can now access the real-time progress of which managers have completed their peer review selection. We give you the ability to remind all managers who are still incomplete or send reminders one by one. You can do this by clicking Remind Incompletes or individually by clicking the 3 dots (...) next to an employee's name > Send reminder. Admins will have the ability to add additional peers for their employees once the cycle is underway, but we encourage you to have all peer selections complete before progressing. Click "End peer selection" when you are ready to advance to the next stage of the cycle. Note: If a manager has not approved one of their direct reports peer nominations before you end the review cycle, the peer nominations will automatically become effective. Now it is time to send a launch email and officially kickoff reviews!